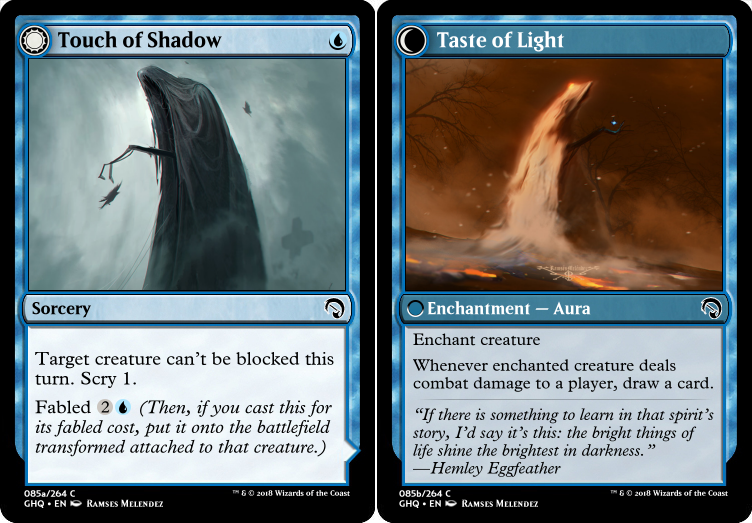 The tried and true Monstrosity from Magic proper returns, allowing early-game creatures to stay relevant later on and feeding both embattled and dominance. 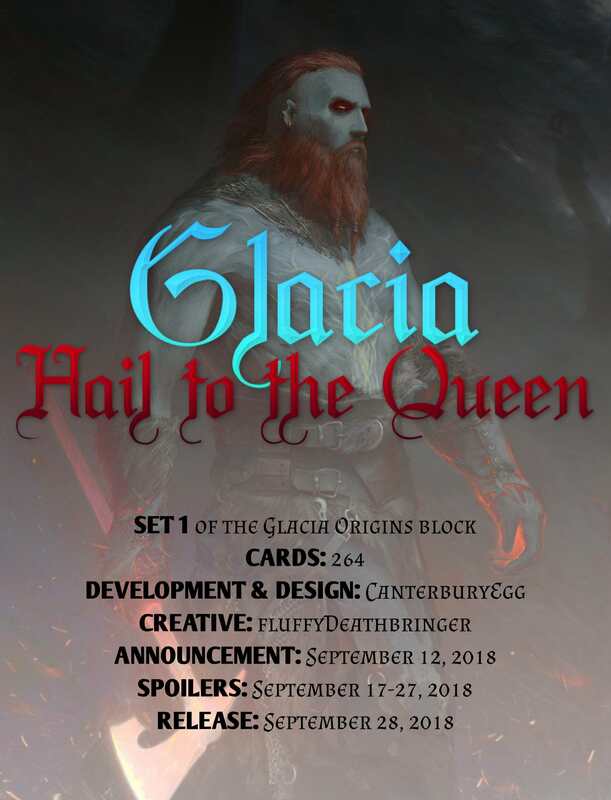 With all five mechanics pulling together to amp up combat, Glacia: HQ promises to provide both an intense Limited experience and a slew of powerful Constructed staples sure to satisfy any attacking aficionado. Stay tuned! Now that we've seen the mechanics, all that's left is the story. How does Glacia change into the world we've seen in the previous set? How do this set's characters make it out? How do the old set's characters rise from the fallout? Seeing that will be something interesting to look forward to. Nice to see more of Glacia! That aside, sorry it took me a while - I wanted to comment on your mechanics when I saw them last week, but stuff got in the way. 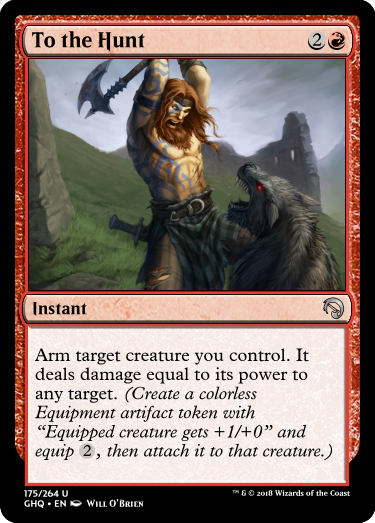 Arm is a nice classic I've seen being used to great effect a few times now, so I know I'll like it here I'm curious, did you intentionally not make the tokens boost the toughness as well? 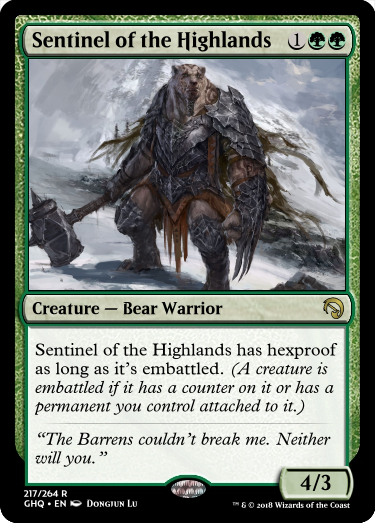 I really like To the Hunt, nice flavorful card to showcase the mechanic. Embattled is interesting. I've seen similar pseudos caring about your stuff being enchanted and/or equipped in the past, never combined with having counters as well, though. And I have to say: It might be small, but that's a very clever addition! 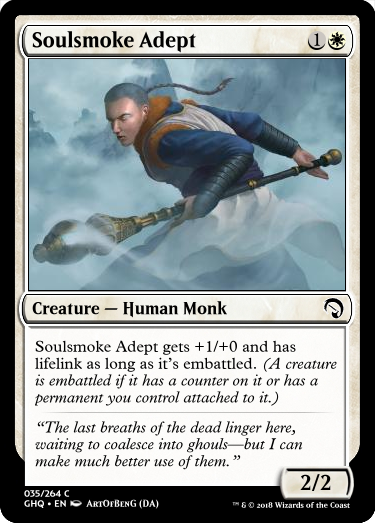 Auras are always dangerous to use and outside of this set's equpment tokens you might not always use many of those, but +1/+1 counters are such a universal theme.&nbsp;Soulsmoke Adept looks like a nice Limited card and Sentinel of the Highlands is a massive powerhouse for sure. 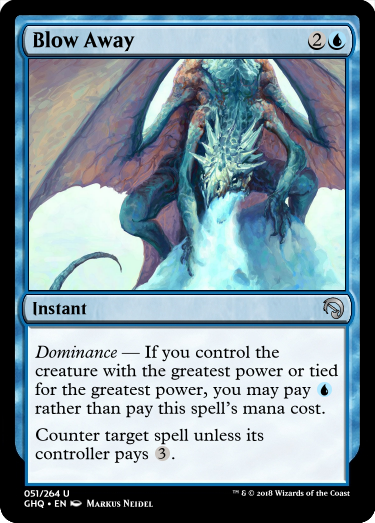 Dominance is an interesting mechanic to return. It had it's fair share of issues back in Ashura because of how the layers work, but at least on your examples this clearly doesn't matter. Crash of Hooves feels really underwhelming, though. Compared to these cards (none of which being particularly strong - even though I personally really like them), it really looks a bit weak imho. 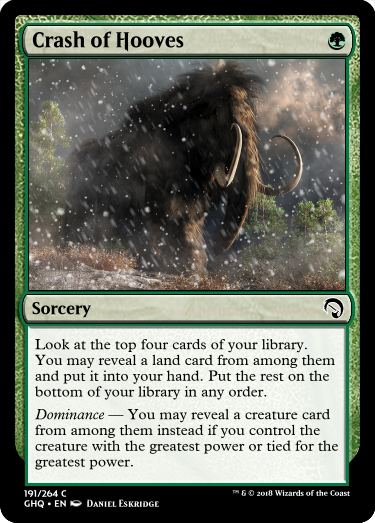 Maybe only look at top two cards to find a land or creature normally and the top four with Dominance? Would be a nice twist to Adventurous Impulse, then (to be honest - maybe too wordy, though?). And finally, I always liked Monstrosity. 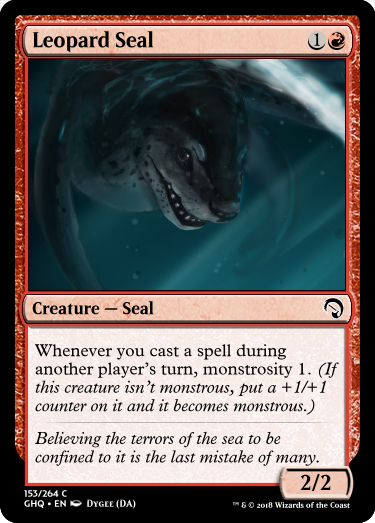 I love the idea behind Leopard Seal, I hope there are other Monstrosity triggers around! Heping sat in silence, his fingers drumming against the arm of the chair in a methodical pattern. His face showed no emotion, but his eyes spoke words of wisdom and understanding. Across the table from him sat Seto San, anxiously awaiting any remote response. Heping’s expression remained constant, much to Seto’s frustration. Still, she remained peaceful at his gaze. For the first time in what felt like years, Heping’s expression changed as he raised an eyebrow. It was gone in an instant, but Seto was sure she had caught a glimpse of a faint smile on the man’s face. Heping nodded, and Seto rose, striding gracefully towards the hall’s southern exit. As she slipped through the door, Heping called to her. She turned, spying a wry grin on the wise man’s face. Xiong gave no acknowledgement to Seto. He knelt over an injured bird, carefully tending to a wound on its wing. “A little livilily powder will do wonders, friend. You’ll hardly know you were ever broken.” The panda took a miniature vial out of his satchel and dusted the bird with a sparkling red mist. The bird chirped feebly as Xiong lifted it into a makeshift nest he had fashioned from sticks and leaves on the forest floor. “I do, panda.” Seto breathed through her anger. The panda turned on heel and vanished into the twisting trees. Seto thought to call after him, but decided against it, and irately paced away in the opposite direction. Xiong sat between two mounds of dirt, each marked by a pewter boulder. He rested a paw on each side of him, gathering soil between his claws and letting it slowly crumble back to the ground. He took one more somber look down at the mounds beneath him. “Goodnight, fu mu,” he whispered, before dashing off into the falling dusk. I don't remember much of GNJ-block story stuff, so it's nice to see the characters' personalities come out here. 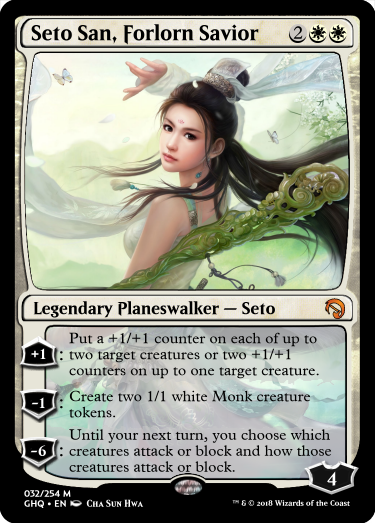 Seto's literal-mindedness is a neat characterization aspect, along with her apparent impatience that surprised me, given my earlier impression of her. 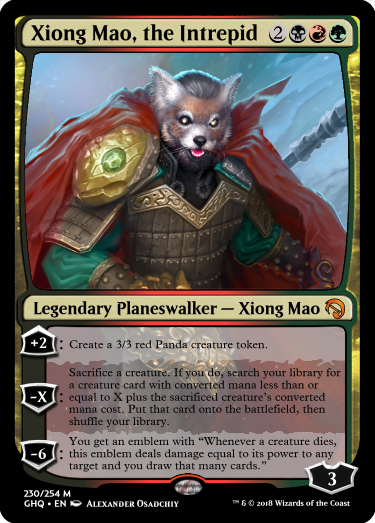 The impression I had of Xiong prior to this post was just "callous survivalist who cares only about his own well-being", and that's been decidedly eradicated by the elucidation of his true aims and struggles. Given the literal zero traction this set has gathered, I'll post a set file for you to all enjoy! I'll write a limited archetypes article and a few more story tidbits in the coming days.